Shoshanna and I taught a class at School House Craft this past weekend, based on my article for Design*Sponge, Setting Up Your Online Shop. When you’re ready to start selling online, you may feel overwhelmed with options. Just figuring out how to get started can be daunting. There are many things to consider, and in this article, I’ll provide an overview of the basics you’ll need to plan for – consider this a checklist of sorts, to make sure you’ll be starting out without missing a step! For the class, we made an actual ecommerce setup checklist that our students filled out as we discussed each piece.The class was lively, and we loved how supportive and helpful our more informed students were. The hour and a half flew by, and attendees were able to take the checklists home to make sure that they weren’t missing any vital steps in setting up shop. Today, we are sharing it with you, as a companion piece to the original article. 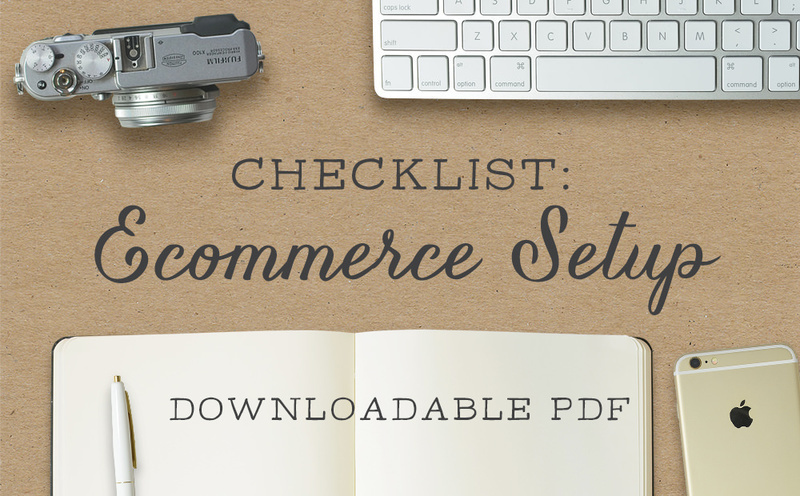 This download includes the full article, so you’ll understand the checklist, and the checklist itself. You can get our resource list here, for recommendations of software to use and more articles that share tips for getting started: Aeolidia’s Best Ecommerce Resource List. Go ahead and subscribe to my newsletter while you’re here! I share lots of good information like this for free, straight to your email. Boy do I wish I had had this list when I first started! It’s terrific! Thank you, Jill! There’s a lot to keep track of.